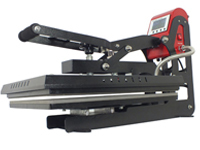 The Summit Pretreat machine can dramatically improve your DTG print quality and production time. The industrial spray nozzle is controlled by a simple microprocessor to ensure a uniform spray pattern for perfect pretreatment every time, allowing for better prints and washability. With 3 included platens (standard, large, and an extra large 24x15 inch) pretreating shirts is easy and fast. Just lay the shirt on the platen and press a button. In just a few seconds, you will have a perfectly pretreated shirt. Platens are easily changed in seconds – no tools required. The touch-screen LCD control panel allows access to many settings, including adjusting presets, changing spray area, changing nozzle speed to apply more or less pretreatment, and switching between bi-directional or uni-directional. 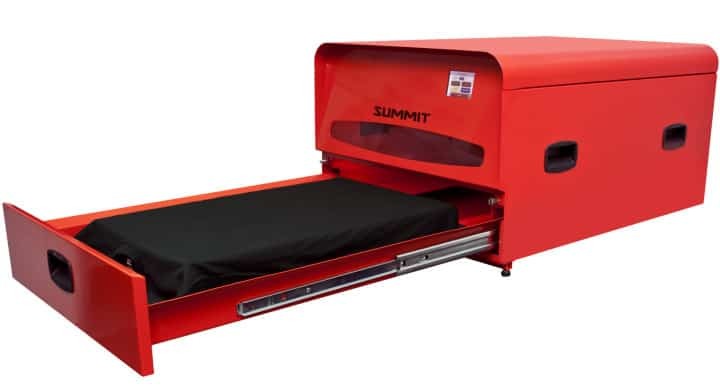 The Summit Pretreatment Machine includes an ultra-quiet built-in air pump, so no air compressor is required. Another practical feature is the automatic flushing system designed to help prevent clogs and ensure consistently even spraying. No need to buy expensive proprietary containers for the pretreatment liquid - the Summit Pretreating Machine works directly with off-the-shelf bottles of pretreatment.